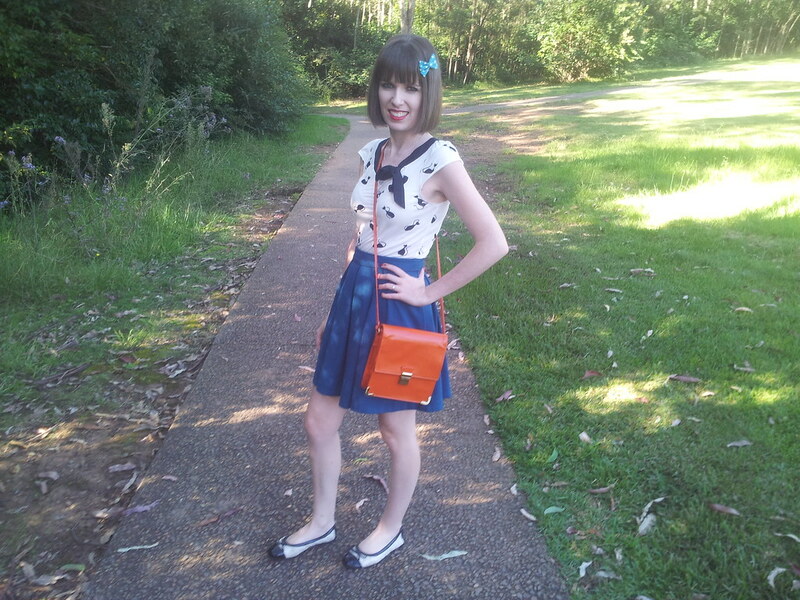 This is an outfit I wore on the weekend. I love this top, it is one of my favourite items at the moment because it has little cats printed all over it. I was so excited when I saw this top in the store because it represents me so well. I definitely believe there should be more cat printed clothes in the shops! I also like the bow and the combination of black and white. This top inspired me to start wearing my black and white quilted ballet flats again because they match so well. I haven’t worn them for ages, I’m not really sure why because I still very much adore them. 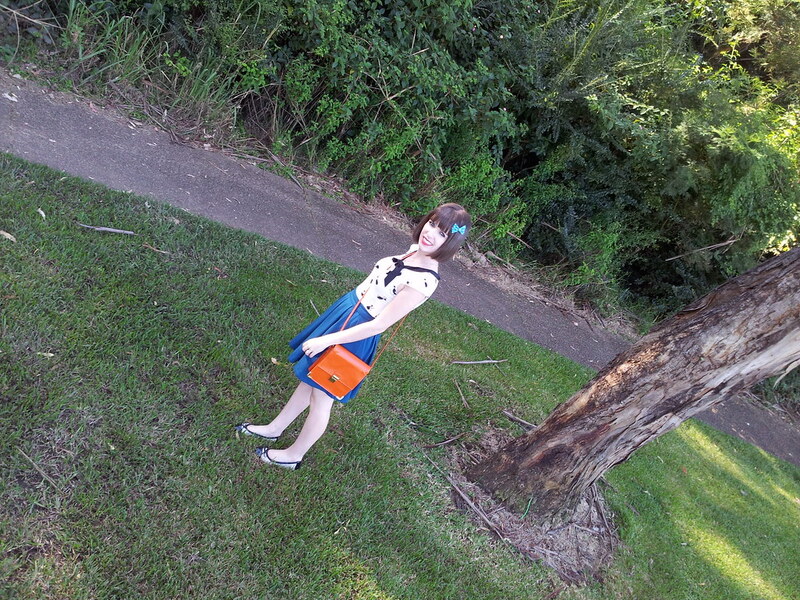 Before I left the house on Saturday, I asked my sister which bag would look best with my outfit. She came up with her orange bag that she let me borrow. I never would have thought of orange but it I think it works really well. I love the way it stands out against my outfit. I can’t wait until Wednesday afternoon when I’ve handed in my last assessment and it’s Easter holidays. 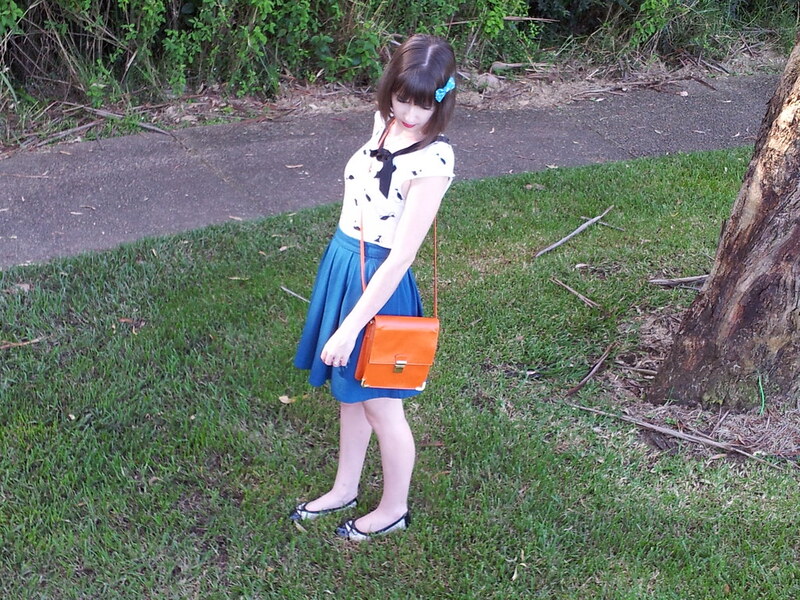 This entry was posted in Dotti, Outfits, Portmans. Bookmark the permalink. The cat print is amazing on the top. And loving the colour of the skirt. Together they look great! Have fun on your break!! Oh that blouse with the cats on is adorable! 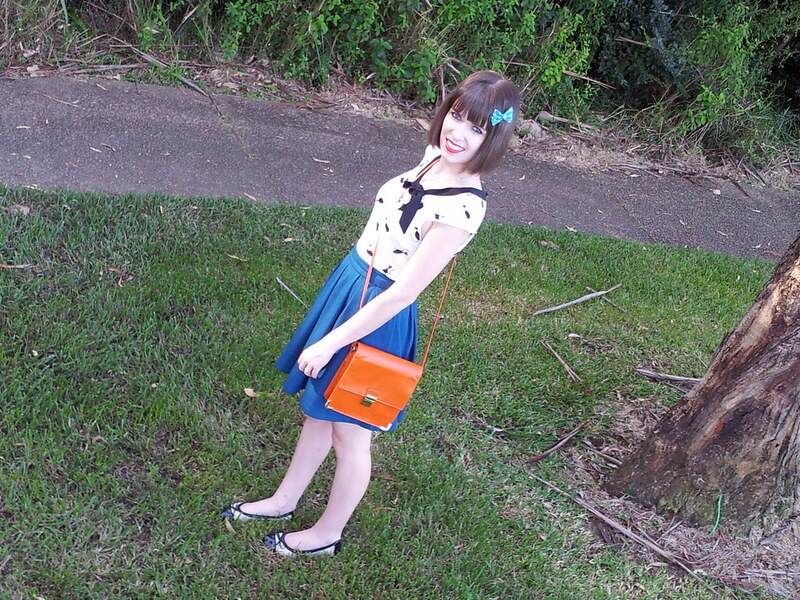 I love the retro style skirt! You look lovely! I love, love that cat shirt, and the whole ensemble is ttoo cute. You are a true doll. What a lovely outfit! nice blue skirt! I love the bag. Beige leather and blue textile goes well together. Thanks for posting the photos and feel free to drop by me too when you have time. I really like the print on your top. Have a nice holiday. So so cute! I love the bow in your hair and the pretty color of your skirt. Adorable blouse too. You always looks so cute! aadorable outfit! i love the bag! Love that bag and your darling haircut!